X-ray inspection systems for packaged products offer maximum contamination detection sensitivity at high throughputs for a diverse range of food and pharmaceutical applications. Typical packaged applications include the inspection of foil and plastic containers, cartons/boxes, foil pouches, bags and sacks, trays, tubes, sachets, flow-wraps, PET bottles and blister packs. X-ray inspection systems for packaged products deliver outstanding physical contamination detection of dense contaminants such as glass, metal, mineral stone, calcified bone and high density plastics. Contaminants are readily detected irrespective of their size, shape or location within the product. X-ray inspection technology is not affected by changes in product temperature or moisture. This ensure consistent performance, minimized false rejects and complete product safety. 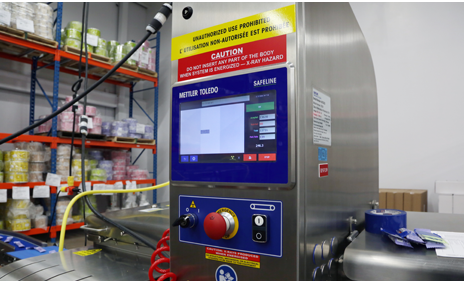 METTLER TOLEDO Safeline X-ray inspection equipment is able to simultaneously inspect packaged products for a range of quality control checks. These include measuring gross and zoned mass, counting components, identifying missing or broken products, monitoring overall and zoned fill levels for portion control, detecting product trapped within the seal and checking for damaged products and packaging. 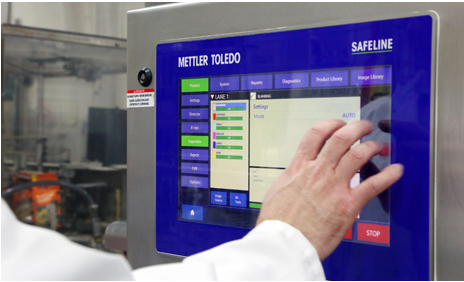 METTLER TOLEDO Safeline provides advanced x-ray inspection capabilities for packaged food and pharmaceutical products. Energy efficient and adaptable solutions with a range of power options are available. Some models do not require a cooling system due to low power consumption contributing to a reduced Total Cost of Ownership (TCO) for customers, making it a future-proof investment. What packaging types can be inspected using X-ray technology? There are no limitations on types of packaging an x-ray system can inspect. METTLER TOLEDO’s X-ray range consists of the widest group of specialist x-ray solutions on the market. Solutions available include dedicated x-ray systems for packaged, glass and canned products as well as pumped and bulk applications. Typical packaged applications would include foil and plastic containers, pouches, trays, sachets, cartons and boxes, bags and sacks, flow-wraps, PET bottles and blister packs. What effect does package type have on sensitivity? Traditionally some packaging types could affect sensitivity performance, however our advanced tools, such as ContamPlus™ x-ray software, eliminate packaging effects. Product testing is crucial to determine the best solution for your application. Where on the production line would I place the x-ray system? 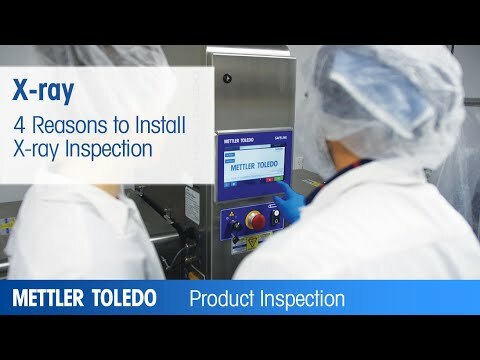 Typically packaged food products are inspected at the end-of-line, however x-ray inspection system for packaged products from METTLER TOLEDO can be installed at different stages of a production line. They can inspect incoming goods for contaminants such as metal, glass, mineral stone, calcified bone and high-density rubber as well as further down the production line, during processing and end-of-line packaging. For packaged products METTLER TOLEDO x-ray systems can be used to inspect primary and secondary packaging, ensuring product safety. How does automated product set-up benefit manufacturers? Automated product set-up and changeovers brings faster start-up times, increases production uptime and reduces programming errors. Manufacturers benefit from obtaining the best contaminant detection results possible, protecting brand integrity and reputation. 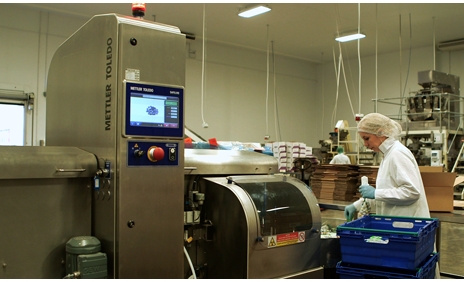 How many packs per Minute (PPM) can be inspected by an x-ray system? Typical throughput rates can vary from 300 products per minute to 1,000 products per minutes, depending on the application. What other inspections further than contaminant detection can be done? Can I sort my rejects so they can be managed differently by our quality teams? Yes. Rejected product sorted by rejected type, for example contaminated product could be rejected into one bin and product defects, such as underfill/overfill, into another. This will reduce product waste, as these items can be reworked, saving product and costs. Will the x-ray system damage my packaging while inspecting or rejecting? We have a number of different guiderails and reject options to suit a diverse range of product types, shapes and sizes to ensure safe product transfer in and out of the x-ray inspection machine. X-ray inspection systems avoid as much physical contact with the product as possible. My product is lightweight, I am worried the x-ray curtains will push it off the conveyor? METTLER TOLEDO Safeline X-ray have a number of solutions based on the product they are inspecting. There are some very lightweight products that could be affected by the curtains disturbing them, however we have a lot of experience and knowledge in these applications and have x-ray solutions for lightweight packets so the presentation is not compromised when travelling through an x-ray system.